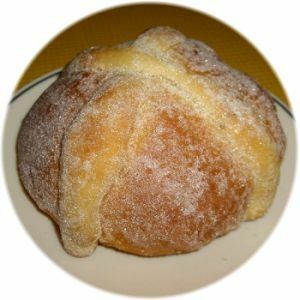 Pan de Muerto, Day of the Dead Bread, Bread of the Dead or Dead Bread for short is a tasty traditional egg-based sweet bread made for the Dias de los Muertos holidays in Mexico, the United States and in other Latin American countries. 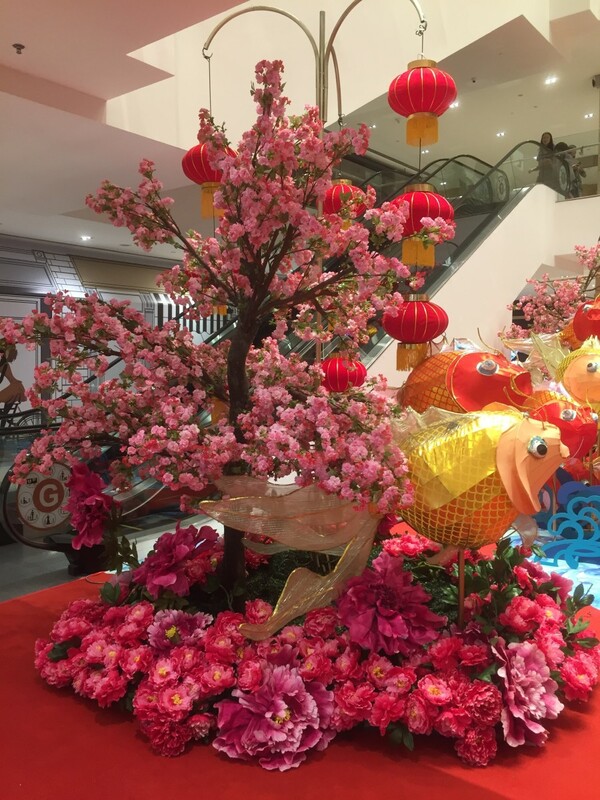 The holiday is celebrated around October 31 to November 2, depending on the region. Day of the Dead Bread, Pan de Muertos is usually flavored with anise and orange and is shaped into skulls, skeletons and rounds of bread decorated with bones or crossbones. While any egg bread takes time to make as you need to wait for the yeast to rise, not once, but twice, those who have sampled these sweet breads know that the bread is worth the wait. It has been reported that in some rural regions of Mexico "residents will walk or ride as far as they must to purchase pan de muerto." This traditional sweet egg bread is a recipe found in many cultures. Discover more about the Dia de los Muertos traditions and try some Pan de Muertos recipes for making your own Day of the Dead Bread. Day of the Dead Bread by hexenesi. Used under a Creative Commons License. Dia de los Muertos Altar by Caitlinator. Used under a Creative Commons License. Pan de Muertos, Day of the Dead bread is part of the traditions of the Dia de los Muertos celebrations. The dead bread is made during this holiday time to place on the altars (Ofrendas) and in the cemeteries for the departed spirits or deceased loved ones. The tradition of bringing bread to cemeteries or places where the dead rest may go back to the Aztecs. The Aztecs made cakes to place on top of their tombs, where the food was used to sustain the spirits on their journey to their underworld. 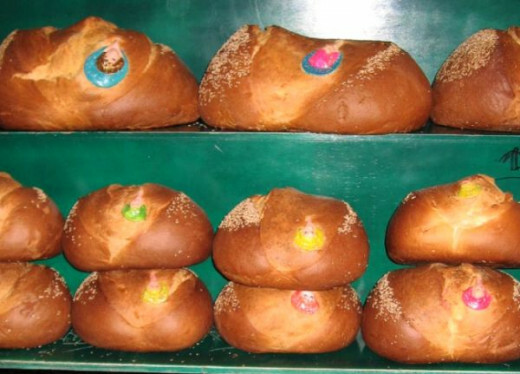 Different villages and countries have their own unique style of Pan de Muertos. One popular style is the one pictured above is of a round bread loaf with bits of extra dough used to make bones for the top. Other popular shapes are skulls, skeletons and in some regions, humanoid like figures called animas (souls). Bread of the Dead is not only for the departed. Pan de Muertos is enjoyed by the living with hot chocolate as they tell stories during the holidays about loved ones who have died. Day of the Dead food, Culture is a really flexible thing, says Tempe resident and cultural anthropologist Linda McAllister. At a Dia de Los Muertos observance in Guadalupe a few years ago, she saw a Big Gulp as a grave offering. The avenues are lined with cempasÃºchil flowers, elegant death stalks the streets, and there's a bit of a controversy over the four million peso mega ofrenda the city built in the central plaza—yes, it's Day of the Dead in Mexico. A look at the Day of the Dead or Día de los muertos in Mexico. Images by San Jose Library, Rhapsodyrabbbit, Christine Zenino and Zerethv. 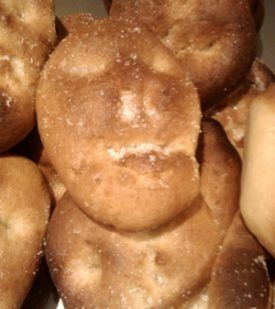 What do you think about Day of the Dead Bread or Bread for the Dead? Interesting, I'd like to try foods from other countries and cultures. I might like to try it. Interesting, but I'd rather leave it for the dead. Bread of the Dead is often formed in different shapes. One of the more common is in the shape of a skull, or a round loaf where strips of dough have been attached at the top to resemble bones. 1. In a saucepan over medium heat, melt butter. 2. Add milk and water until warm, but not boiling. 3. Measure out 1-1/2 cups flour and set the rest aside. 4. In a large mixing bowl, combine the 1-1/2 cups flour, yeast, salt, anise seed and sugar. 5. Add the warm butter, milk and water mixture until well combined. 6. Add eggs one at a time, then mix in another 1 cup of flour. 7. Continue adding more flour until dough is soft but not sticky. 8. Turn dough onto lightly floured board and kneed for ten minutes until smooth and elastic. 10. Cover with a cloth and let rise in warm place (oven on low heat) until doubled in bulk, about 1-1/2 hours. 12. Shape dough into small loaves resembling skulls, skeletons or round loaves. 13. Pieces of extra dough can be added on top as "bones." 14. Let these loaves rise for 1 hour. 15. Bake in a preheated 350 F degree oven for 40 minutes. 16. Remove from oven allow to cool. 1. Mix sugar, orange juice and orange zest in a small pan. 3. Apply to bread with a pastry brush. 4. If desired, sprinkle on sugar crystals or colored sugar while glaze is still damp. Recipe modified from Day of the Dead Bread. Tohono Chul Park Activity Brochure. Some of the extras needed to make this recipe are a citrus zester to get the freshly grated orange zest and the spice anise. 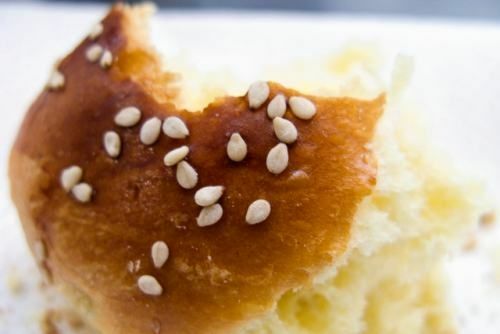 Anise is the spice that gives the Pan de Muerto it's distinctive taste. This small granite mortar and pestle is perfect for grinding up small amounts of fresh spices and herbs for your favorite recipes. Use it to grind up some fresh anise powder for Day of the Dead Bread. 1. Mix all dry ingredients together except the 3 - 4 1/2 cups of flour. 2. Heat, but do not boil the milk, water and butter in a small pan. 3. Add the warm milk mixture to the dry mixture and mix well. 4. Add the eggs and 1 1/2 cups additonal flour to the mixture. Beat well. 5. Slowly mix in the rest of the flour, a bit at a time. 6. Turn the mixture onto a floured cuttting board. Kneed the mixture on the cutting board for 9 -1 0 minutes. 7. Put dough in a greased bowl and allow it to rise until it has doubled in size about 1 - 1/2 hours. 8. Punch the dough down and shape - as a person, animal, bone, skull or oval. 9. Let the shaped dough rise for another hour. Bake ad 350 F for about 40 minutes. After baking, sprinkle with colored sugars. 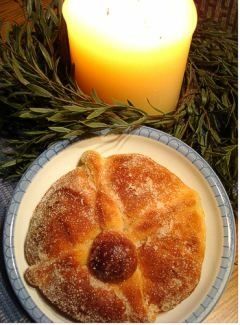 Decorate with crystallized fruit or gummy bears.Pan de Muerto recipe adapted from Festival of Bones found below. Skeleton-shaped Bread for the Dead by gicelamorales. Used under a Creative Commons License. A bilingual primer book in English and in Spanish about the Day of the Dead or the Festival of Bones. Measures 7.3 x 7.4 x 0.4 inches. Ready to Try Some Delicious Dead Bread? Eating Pan de Muerto by Hector Lazo. Used under a Creative Commons License. 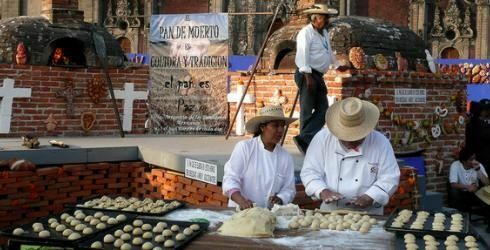 Guelaguetza head chef, Maria Monterrubio from Los Angeles show how to make pan de muerto Oaxacan style for Dia de los Muertos. A quick recipes from Kook to Cook for Bread of the Dead. Additional recipes for Pan de Muerto, Bread of the Dead for Dia de los Muertos. A recipe for Pan de Muerto (Bread of the Dead) from azcentral.com. Day of the Dead Bread recipe from Houston Institute for Culture, Traditions of Mexico, Dia de los Muertos. 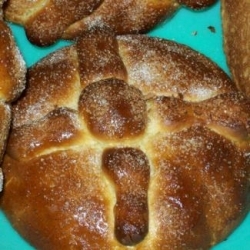 In Mexico, they bake pan de muerto--Day of the Dead Bread--to celebrate All Soul's Day. This lightly sweet bread is a delicious addition to any Las Dias de Las Muertas (Day of the Dead) offering or celebration. 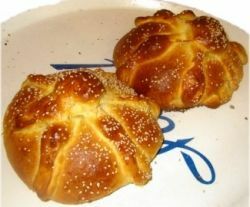 A recipe for Mexican Bread of the Dead from the All Recipes website. In celebration of Mexico's Day of the Dead, this bread is often shaped into skulls or round loaves with strips of dough rolled out and attached to resemble bones. In Mexico, pan de muerto is made during the Day of the Dead holiday. Traditionally sweet and flavored with anise, the bread is ceremoniously placed on altars or brought to gravesites as offerings to those who have passed away. Pan de muertos | Flickr - Photo Sharing! Pan de Muerto, "Bread of the Dead" In celebration of Mexico's Day of the Dead, this bread is often shaped into skulls or round loaves with strips of dough rolled out and attached to resemble bones. A three part video series in Spanish by netodeverdad on how to make Pan de Muerto. Pan de Muerto, Day of the Dead Bread or Bread of the Dead is the traditional sweet bread made for the Dias de los Muertos holiday celebration. 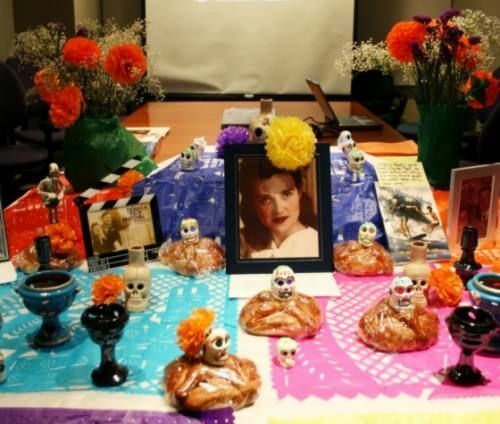 La Ofrendas (like the one pictured) are created to honor the memory of a family member who has died. 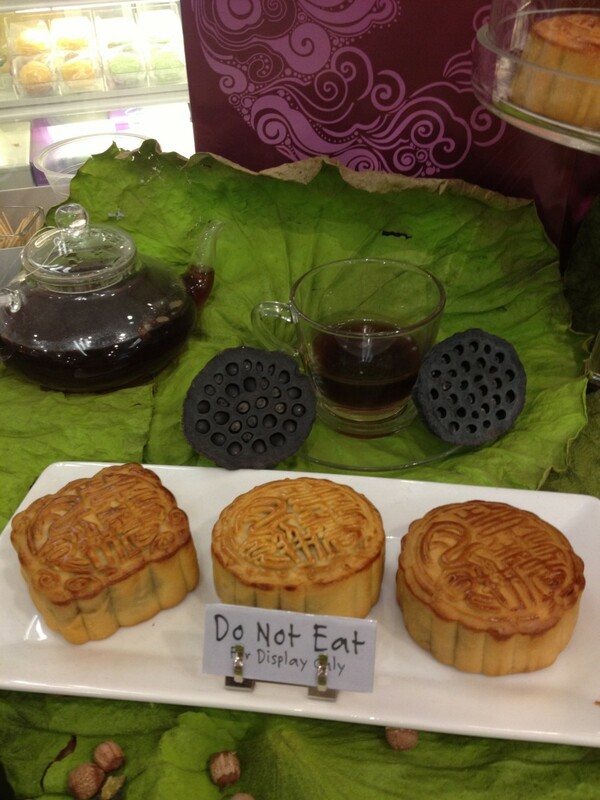 These altars include many of the foods, beverages and other things that the deceased enjoyed in life. Pan de Muertos or Bread of the Dead is also included on the elaborately decorated ofrendas, or altars as part of the adornments. Some sources say the dead bread offers nourishment for the departed souls on their journey home, where as others say pan de muertos is included to entice the souls to come home for a visit. 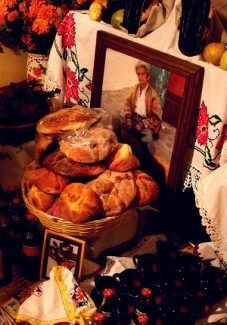 The traditional sweet bread is also brought to gravesites as offerings to those who have passed away and for the living to eat as they sit in the cemetery enjoying the company of the souls of their lost loved ones. Some of the most popular books on Day of the Dead. 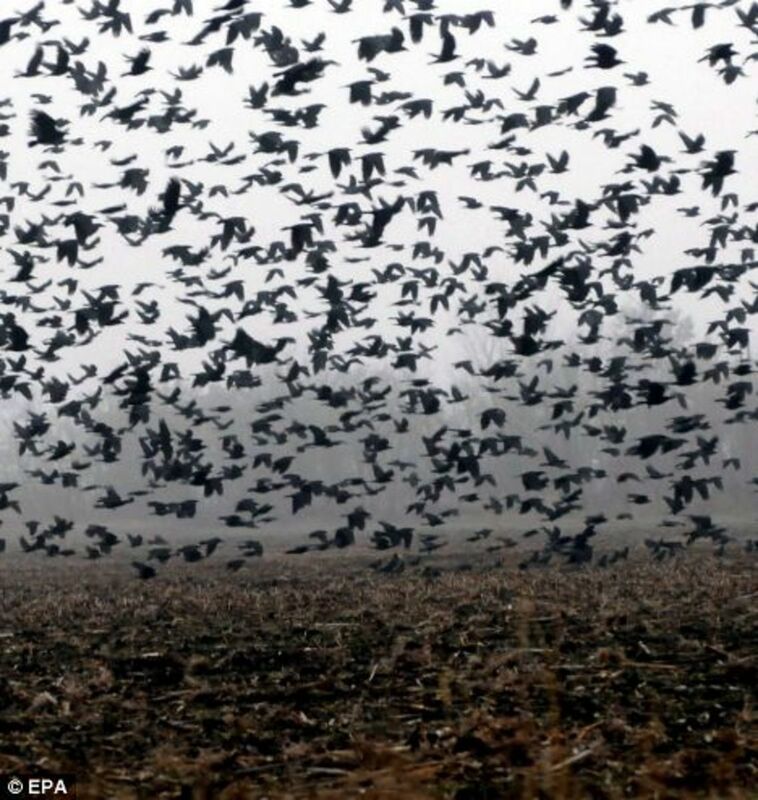 A beautiful story about remembering loved ones who have died during Day of the Dead and the connection with the returning monarchs, believed to be the souls of the departed. Different cultures have created their own unique variants on the standard egg bread recipe or sweet dessert bread that uses flour, eggs, milk, butter and yeast, by using different spices and additives. Pan de Muerto is an egg bread recipe baked for the Day of the Dead. In this recipe the spice anise is used and the bread is topped with a orange juice and orange zest glaze then coated with crystal sugars. In Finland, my heritage, they use the spice cardamom in the egg bread recipe to make a sweet bread called Pulla or Finnish Cardamom Bread. Sometimes raisins are added and the bread is topped with sliced almonds. Pulla is a special Christmas treat that my Mom still bakes and turns it into different shapes, usually braids and rings. With the English Hot Cross Buns there many different variants on the egg bread recipe, where the bread is baked into buns more than into bread. I've found several different recipes just within the ones done on Squidoo. In the Hot Cross Buns use a bit of both and add in more spices with cinnamon, cardamom, other spices like cloves, allspice, nutmeg and raisins or currents along with orange zest. Pan de Muerto by Ladycliff. Used under a Creative Commons License. Although occurring around the same time of the year as Halloween, Dia de los Muertos or Day of the Dead, is a very different holiday. Dia de los Muertos is celebrated in many Latin American countries with a different focus. Face masks part of the celebrations of Dia de los Muertos or the Day of the Dead, a holiday celebrated in from late October to early November in Mexico and other parts of Latin America. Teaching children about bone anatomy can be made a bit easier and a lot more fun for the children by using some songs, dances, quizzes and other innovative ways of learning bone anatomy. Skeletons have been a symbol of death at least since the Middle Ages when they were portrayed as the Grim Reaper. Skeletons make excellent teaching tools, especially at Halloween. Since my daughters were in Kindergarten and Pre-School I have been going into their classrooms for years and teaching bone anatomy. Skulls and Skeletons cakes and cupcakes are a fun way to add a bit of scary bones to Halloween, Dia De Los Muertos or any other occasion where skulls and skeletons can be used. Does this look like a recipe you might try for Dia de los Muertos? I do love bread so much - I may have to try these recipes! Your Pa de Muerto Recipes sound very good. It would be fun to try it.